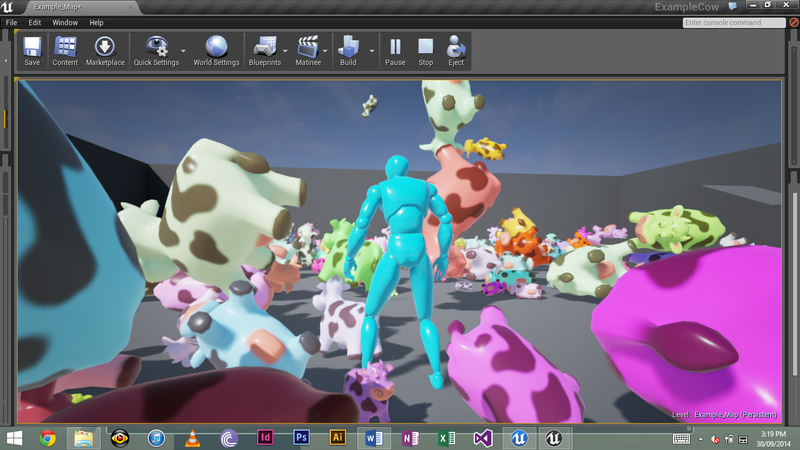 Blog 2/Week 2: Pitch and having fun with blueprints (with exploding cows). – Bloggity of my inner thoughts. Blog 2/Week 2: Pitch and having fun with blueprints (with exploding cows). Overall Goal – Share ‘X’ with the public. Environmental Hazards: Dangerous Pits, Dangerous Pits that steam up. Officers: Melee with fire pipes/ inflict more damage than thugs. Implementation of Sound Effects to match art style and time period. Possibility of In Combat and Out of Combat music. With the feedback given in regards to our pitch we were able to make some changes to our mechanics, such as giving the tougher enemy a gun/ranged weapon. In the third session, the majority of it was spend learning a tutorial on Unreal 4. We learnt a bit more on blueprints by spawning objects into the scene. With the tutorial we were following, we used a cow as our object to spawn. We were having a bit of a play/experiment on how fast/frequent we wanted to spawn the cows. We also learned how to make the cows explode with the press of a button. Screenshot of spawning cows (look at them, oh so many). Pingback: Blog 11/Week 13: The Final Stretch for Claudia!! | Bloggity of my inner thoughts.